Premier League Round 5 was an interesting round. Kissing Point move from four to two on the table. North Sydney manage to drop from two to six and the match between Knox and Chatswood Rangers had to be abandoned. Well, who wasn’t concentrating properly last Saturday? West Pymble, who have rumbled over almost every other team, could only hold bottom of the table Northbridge to a draw. Two goals each would have been a decent game to watch. This week, they host second placed Kissing Point, under lights at 7:00pm which has got to be the match of the round. Sadly, I will not be able to attend, but I would urge anyone who likes football to attend. Should be a great match. Who will win? Personally, I think Kissing Point has more to prove, losing the grand final last year which might just give them an edge. But West Pymble will have a partisan crowd and will push for every minute right up until the final whistle. That’s three in a row for Kissing Point and those wins have been big wins: 4:1, 4:1 and now 5:1 against North Sydney. This week they’re away to West Pymble in the match of the round. A grand final replay and current one on the table playing number two. Who will win? As I said above, I think this match is very important to both teams, but I wonder if it is just a little bit more important to Kisso and that might just give them an edge. Lane Cove beat Berowra away from last week. Only 1:0, but a win is a win and vital one for Lane Cove to keep them with the big boys at the top of the table. They are currently equal at 9 points with Kissing Point and Lindfield. They’re ahead of Lindfield on goal difference but trail Kissing Point due to their solid three game streak. This week, they are at home to bottom of the table Northbridge, but remember that Northbridge held West Pymble to a draw, so I wouldn’t guarantee a win. But I would expect one. I watched the Lindfield match weekend against Old Barker. They rattled Barker with their style of play and produced a 2:0 win. It was a good, well-deserved win but they had to work hard to get it. This week they’re away to Berowra and if they bring their in-your-face method of play, trying to rattle their opposition, I think they’re going to find that they have met their match. This will be a tough match to win, but I think they’ll come away with the goods on this one. I was watching the Rangers versus Knox match last weekend. Sadly, off the ball, one of the players (Alex) went down injured in such a way that the match had to be abandoned. Very sad to see and I wish Alex a speedy recovery and hope to see him back on the park playing top flight football very soon. This week, Rangers are away to North Sydney. Given the recent form of Rangers I would predict a win, but this is a game that could be anyone’s guess. North Sydney and Rangers are equal on points on the table, but Rangers have played one game less (the match last weekend being abandoned through injury). North Sydney’s recent form is a draw, a win and then a significant loss to Kissing Point last weekend, so they’ll be looking to stop the rot and win the next round. North Sydney will have home ground advantage when they play Rangers, but Rangers can be a formidable side, so I think they’ll find this one tough. Old Barker fought hard last week against Lindfield. They are a side that is maturing well and developing some good set-plays, but they allowed Lindfield to get in to their heads and mess them around. If they had a bit more fire power upfront, they would probably grab a few more points as their midfield is phenomenal. 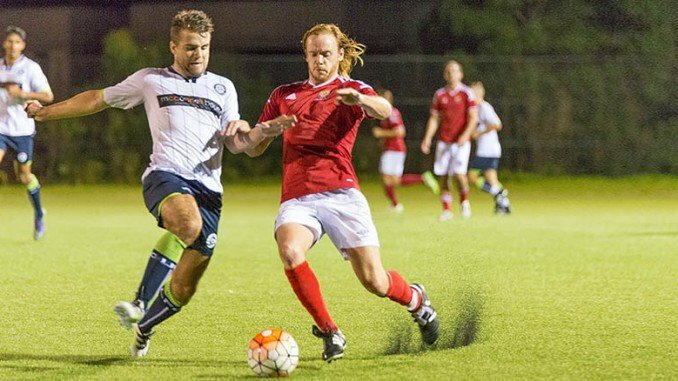 Old Barker faces Knox United this week. Knox have played a game less and are three points behind Barker, so this should be two sides of equal firepower, youth and speed playing a thriller. Berowra hasn’t done too well in its last three games with a draw and two losses. Last week they narrowly lost to Lane Cove. This week they host Lindfield and I think their style of football will be one that Lindfield will find tricky to tame. I think they have a good chance of coming away with the goods on this one. This year Knox have won one match but lost the rest. Last week’s game against Rangers had to be abandoned when one of the players was injured off the ball. Until then, Knox were under pressure but holding their own through their speed of play. This week they play Old Barker. The two old school boy teams will face off on Bannockburn. This should be a game of youth and speed and well worth a look. I haven’t seen enough of Knox this season, but Barker will bring a solid midfield but an inability to finish; they only have four goals to their name this season. Knox has played one game less, but have six goals to their name. But they have let in 11 goals. So Knox has to concentrate on defence and Barker has to focus on attack. A 2:2 draw against West Pymble is as good as a win from where I’m looking. It shows that they can bring it to the big end of the league. That’s two draws this season (and three losses) which could be the beginning of something good. This week they’re away to Lane Cove. This will be another tough match to win and I think they will have to do something special to grab this one.